The Penn Fathom LD is a modern compact lever drag boat reel which is light in weight but heavy in performance. The heart of any lever drag reel is the drag itself and Penn have fitted the Fathom LD with their Dura Drag system. Dura Drag contains a special Phenolic bonding agent that prevents the premature breakdown of the carbon fibre drag material whilst also providing a barrier to water. The result is a smooth and powerful drag which applies controlled pressure throughout the fight with fear of losing the fish through a jerky drag. To match the drag the Fathom LD has a strong full metal body and sideplates and stainless steel main and pinion gears. The 15LD is just the right size wreck drifting as well as general drifting and bottom fishing with 12lb to 20lb class gear. 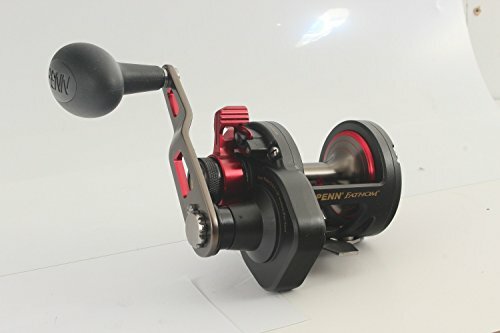 Features o Full Metal Body and Sideplates o Stainless Steel main and pinion gears o 5 Shielded stainless steel bearings o Double dog ratchet anti-reverse o Dura-Drag washers o Capacity 305yds 15lb nylon o Max drag 20lb o Retrieve 5.3:1. This reel includes a free sea book, a free cap and a free spool of braid worth £29.99.